O.H.M.S. Ltd are a company established in 1979 and under new ownership in 1995, reinvigorated gradually by us, Hayley & Pete. We are based in Pershore, Worcestershire, having also taken over and rejuvenated Pershore Lawnmowers in 2001. When we took over, supplied with a 5year old list of approximately 200 customers, everyone within the trade who knew us thought we were stark raving mad. Maybe we were, with a 3 month old baby in tow and suddenly no income! Mainly growing the business through word of mouth, we now maintain a group of approximately 5000 customers, thoughout Pershore, Worcestershire and the surrounding counties of Gloucestershire, Herefordshire and Warwickshire. Thankfully they don’t all require our services at the same time! Peter has approximately 30 years experience in the garden machinery trade, across a high cross-section of brands, both in sales and the workshop. We attend regular technical update seminars, to keep the Company up-to-date with developments on the engineering side. We both attend Sales events to allow us to review our showroom range if beneficial for our Customers. 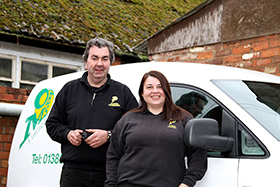 We take pride in our business here in Pershore and how we conduct it, are enthusiastic and love what we do – most of the time!